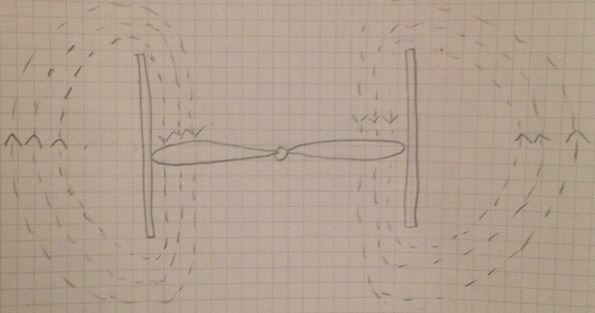 I was told shrouded propellers are more efficient becuase tip vorticies are eliminated by the wall which would imply no induced drag but apparently that is wrong Do ducted fans eliminate induced drag? therefore I've been trying to figure out why they are still more efficient than an open propeller despite still having induced drag. It must have less induced drag. However unlike winglets the walls don't have a pressure difference on either side (it's not an airfoil) therefore the vortex can't be there. So the vortex must be around the whole wall because above the wall the pressure is low and below it the pressure is high. 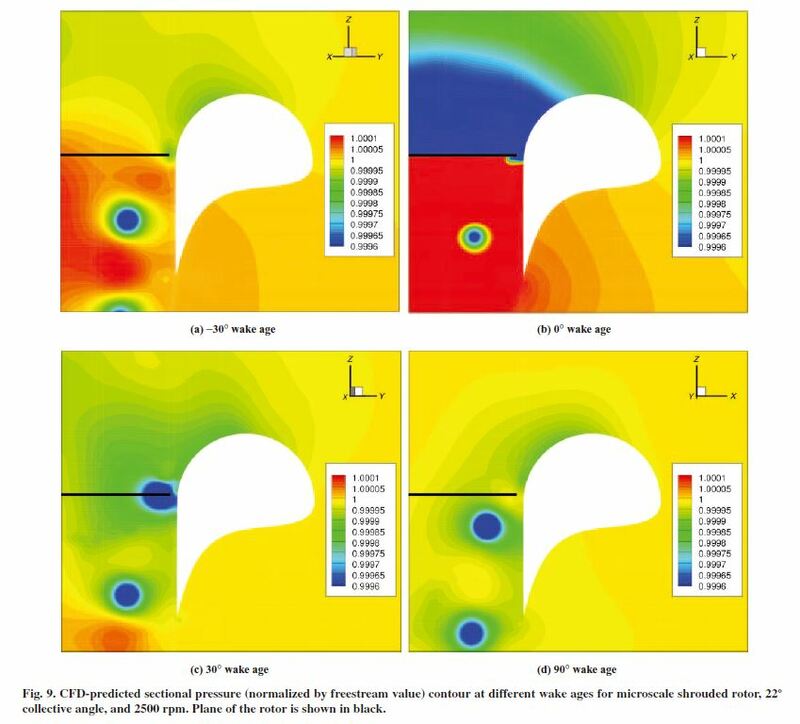 But this doesn't change the effective wingspan so why does it have less induced drag? Therefore induced drag is minimized. Is this correct? Basically, yes. The difference between shrouded and unshrouded propeller is that the shrouded one can produce uniform thrust across the diameter, while for the unshrouded one the thrust decreases near the tips. That way a shrouded propeller accelerates more air than an unshrouded one of the same diameter. This air therefore needs to be accelerated to lower speed, and therefore carries away less kinetic energy, requiring less induced power¹. However, diameter can be varied, so the efficiency comparison is not that straightforward. When the propeller spins relatively slowly, making it larger is better, similarly to how increasing wing span is better, aerodynamically, than adding winglets. However increasing the speed of the tips increases parasite drag, especially if it becomes supersonic. And since increasing size while maintaining angular speed increases the orbital speed of the tips, increasing size only helps to a certain point. That's when shrouds become useful. ¹ In propellers and rotors it is called induced power rather than induced drag, because it counts directly against the engine power. It also describes the physics better, since in both cases it is the work that is done on the air by the reaction to the generated lift/thrust. 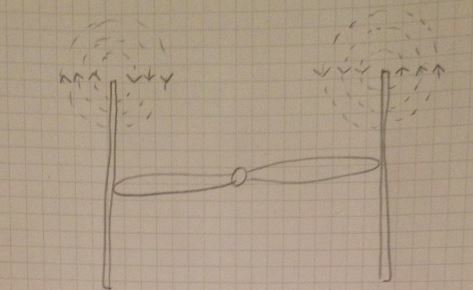 A close shroud, possibly even attached to propeller tips, of sufficient width will stop these vortex. However it may not stop all lateral flow because of the helical flow of the propwash. The helical flow can be reduced with static blades much like those used in axial flow compressors on gas-turbine engines. The shroud does increase add parasitic and form drag but it most definitely does reduce induced drag. No, the vortices are trapped in the tip clearance. What if there's no "outside" at all to your setup? Imagine a theoretical scenario where the entire space outside the duct is solid to $\infty$. Where are the vortices now? They could only be within the tip clearance. I just realized this paper from another question is the perfect answer to this question. And your assumption of shroud somehow making the downwash uniform is also wrong. Note that although the drawing in the statement of the problem or this paper is for a two-blade shrouded fan, even a fan with a very high solidity factor, e.g. 0.8~0.9, as used in high bypass-ratio turbofans, does not equalize fan wake, and that equalization happens only due to shear friction between the infinitesimal pockets of air themselves. 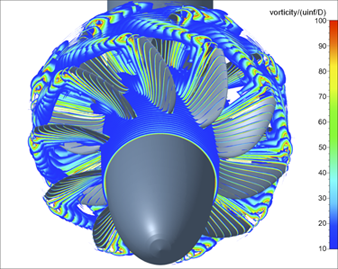 Found this CFD of a turbofan's fan. Not the answer you're looking for? Browse other questions tagged aerodynamics propeller efficiency fluid-mechanics wing-tip-vortex or ask your own question. Why do propeller blades not have winglets? Why don't more airplanes incorporate spiroid winglets?